Baghdad, Iraq, April 22, 2010 -- Yesterday's surprising acquittal of deposed Iraqi dictator Saddam Hussein on all counts has been linked to policies and procedures developed and used by former president George W. Bush, Lionel Thrush, a legal analyst with the Legal Analysis Institute for Legal Analysis, said today. Following his release, Saddam Hussein, now a free man, thanked Bush effusively with the words "if it were not for that bean-brained buffoon, I would be hanging from a tree right now" before announcing his candidacy for Iraqi president. "I think the acquittal of Saddam Hussein can be seen as the result of a cascading sequence of unfortunate decisions by the former president and his administration," Mr. Thrush said. "Taken individually, I doubt any one of the Bush administration policies could have gotten Hussein off the hook, but when combined they effectively de-clawed the entire prosecution." The first step to the Saddam Hussein acquittal, Mr. Thrush said, was the decision by the Bush administration to pressure the nascent and hopelessly unstable Iraqi government to move the location of Saddam's trial to American territory, specifically a sealed section of the 890,000 square foot American Embassy in Baghdad, thus placing the trial under the American legal structure. While this step, together with the appointment of a hand-picked American judge from the dwindling ranks of Bush loyalists, did improve the chaotic conditions under which the trial was being run, it also carried with it some unexpected negative consequences. "Basically, by putting Saddam under the Bush legal code, Saddam was suddenly granted all the legal protections Bush had been working so hard to get for himself," Mr. Thrush said. "Suddenly, torture was no longer a crime. Can you believe that? That wiped about 78,000 slam dunk cases right off the map for the prosecutors, because in those cases, even though Saddam's victims were undoubtedly tortured and had the scars to prove it, the specific kinds of torture Saddam and his henchmen used were not among the ones spelled out as prohibited by Bush's torture law. Bingo, off scot free on a technicality." 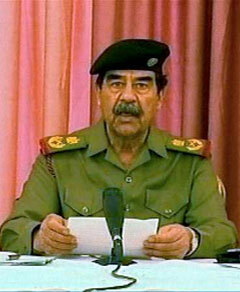 The case against Saddam for mass assassinations ordered following an assassination attempt was also weakened to the point of triviality by the invocation of Bush's "pre-emptive doctrine", under which it is legal to kill people who are suspected of intending to do harm, prior to their actually doing it. "That was another 20,000 cases out the window," Mr. Thrush said. "Saddam only had to argue that these people he killed presented a clear and present danger to himself and his government – and by extension, his country, even though they were his own countrymen. Because precedent had already been established by Bush through his own use of preemptive warfare, the prosecution didn't have a leg to stand on." Similarly, Saddam's documented use of weapons of mass destruction was found to be no longer illegal when considered in the American legal context, due to the Bush administration's withdrawal from international treaties prohibiting the use of such weapons. Normally, crimes are tried based on the legal standards that were in effect at the time the crime was committed, Mr. Thrush explained. However, another Bush order effectively made the more recently passed laws on allowable forms of torture and preemption retroactive, presumably to help Bush save himself from criminal felony and war-crimes prosecution. The retroactivity, however, also granted Saddam the same protections, since legal standards by definition apply to all those under the country's legal umbrella, rather than the president alone. Mr. Hussein, whose estimated $3.4 billion in personal assets have been restored following his acquittal and release, said he plans to use some of the money to hire former Bush advisor Karl Rove as his political consultant and campaign manager for the upcoming Iraqi presidential elections. His chances, he said, "look very bright."